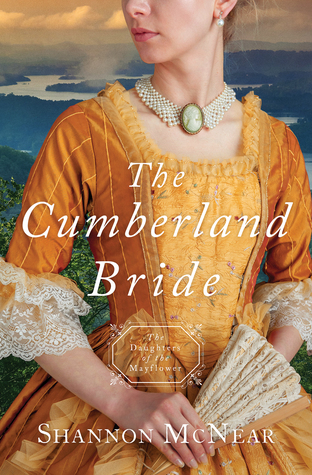 The Cumberland Bride (2018) by Shannon McNear is the fifth novel in the Daughters of the Mayflower series. This book comes in all forms including eBook, and is 256 pages in length. With a full-time job and a very busy six-year old at home, this novel took me three days to read. I received a copy of this book in eBook form from the publisher, Barbour Books. In no way has this influenced my opinion of the story. All opinions expressed in this review are my own. I give The Cumberland Bride 5+++ STARS. This novel is Historical Christian Romance at its BEST!!! I have greatly enjoyed the Daughters of the Mayflower series. The Cumberland Bride is one of the BEST stories in this series to date! The Cumberland Bride is beyond good. I was so thoroughly engaged in this fabulous story that in those moments I was interrupted in any way (darn you empty tea cup!!! ), I was frustrated to have to put the book down. The Cumberland Bride is without a doubt a must-read for 2018! I genuinely loved everything about this story. The writing is flawless — pages just flew by. The plot is highly engaging and I felt like I was right there with Kate and her family as they were traveling into wild lands untouched by civilization. It was exhilarating, stunning, and scary. The setting of The Cumberland Bride is gorgeous. I had to stop often to do Google searches so I could visualize the landscape McNear describes. After all my Google searches, I have realized that “gorgeous” isn’t a strong enough word to describe the Wilderness Road. And, by far, the best part of The Cumberland Bride is the relationship between Kate and Thomas. It is one of the best romantic relationships I’ve read in a while. I won’t say more than this so I don’t spoil a thing, but Kate and Thomas’s road to love filled my reader’s heart to near bursting. I am left thoroughly satisfied by the genuineness, sweetness, and passion between the hero and heroine. The Cumberland Bride is a superb Christian Romance. What I really like about both Kate and Thomas’s characters is their propensity to ask God the tough questions. It’s very realistic to me because in my lifetime there have been many moments where I’ve cried out to God and asked Him some really heavy-duty things. My favorite moment involves Kate asking God, “Why? What profit was it that [I] had been spared?” I appreciate this line of questioning because there was a moment in my life when I was near death, but God spared me. I have asked God why He felt the need to spare my life when I know for a fact that the illness I suffered from has taken the lives of many women. What made me so special that my family was spared the pain of losing me, but other families have not been? Sometimes, these tough questions go unanswered, or are given a response later on in life. And, in Kate’s case, her questioning goes unanswered. I think this is because these are the wrong questions to ask. God wants us to focus on something else. And, Kate realizes this a short time later. Just one page over, Kate’s baby brother crawls into her lap, which reminds Kate that, “Circumstances could so easily be different, and every breath [is] precious.” God has our steps planned and knows the day of our return home to heaven. We have to trust God on this fact and let it be. What we should be focusing on is not “why am I spared,” but on how precious a gift every moment of our lives is. We should not squander a single second of our lives or the lives of those we hold so dear. We all need to remember that Time is a major blessing from God. The Cumberland Bride is such an excellent read that I cannot recommend it enough. This story is such a blessing. I am sad that my time with Kate and Thomas is over. If you are looking for a book that has a great plot line, an amazing historical setting, and endearing and well-written characters then this is the book for you! I highly encourage you to purchase a copy to enjoy today. I love this series! These Brides of Mayflower stories are really each great in their own way! Getting ready to start The Liberty Bride soon! 🦋 I love how you presented your case/review. You have encouraged me to consider reading the book and the other in the series. Your review is beautiful, Nicole. I also read The Cumberland Bride and was amazed by it.